This issue features frightfully fabulous Halloween ideas, recipes, and spooktacular savings at Nugget Markets! 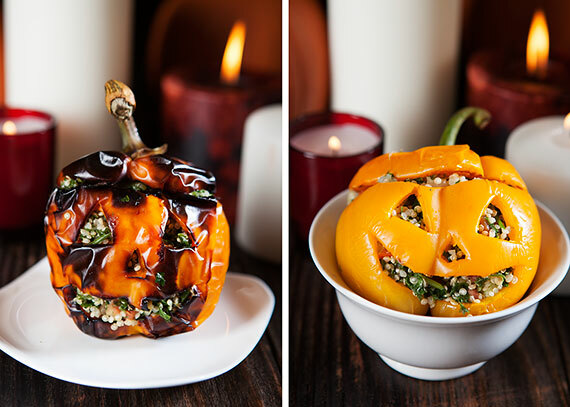 This healthy vegan side can also be served in a roasted pepper or squash for a fun, holiday, Jack-O-Lantern effect! 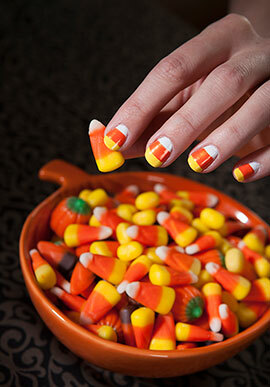 For the love of candy corn! 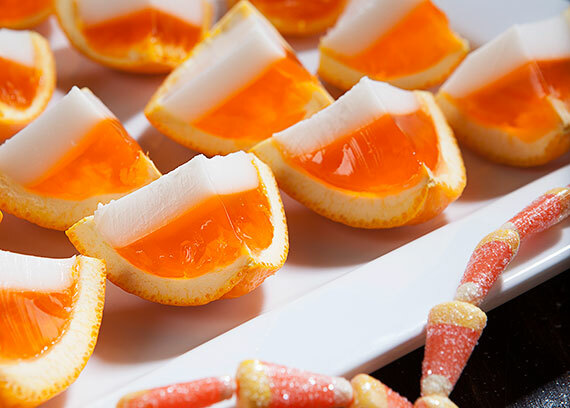 These simply adorable jello shots are a fun, easy and festive treat perfect for any party and while they pack a punch, they taste divine. Follow our simple tutorial for a candy coated manicure! Apply two thin coats of Zoya’s Snowhite (white) on entire nail and allow to dry before applying next layer. Apply two thin coats of Zoya’s Pippa (yellow) on the top 2/3 of the nail and allow to dry before applying next layer. Apply two thin coats of Zoya’s Ginger (orange) in the middle third of your nail. If a clear topcoat is desired, allow all layers/colors to dry completely before applying the topcoat. Remember: Candy corns themselves aren’t perfect, so don’t fret if you can’t get a perfect line. Here’s to a fabulous fall! 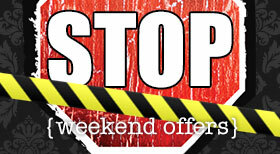 To ensure availability for your party, ordering 24 hours in advance is advised. The winter squash harvest begins in early fall, and during this time, Mother Nature does not disappoint. The varieties, shapes and flavors are numerous, and several local farms harvest squash all winter long. We source ours from local farms including Full Belly Farm, Terra Firma Farm and Riverdog Farm. If you’re in the mood for baking, mashing, puréeing, stuffing, grilling, roasting, or toasting, there’s a squash for every occasion! 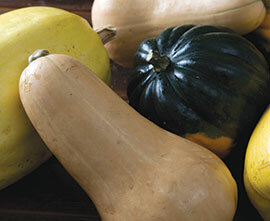 Consult our Squash Primer to find your favorite variety. Grown in West Sacramento. 78¢/lb., save $1.21/lb. Get in the Halloween spirit with this festive bouquet. $9.99 ea., save $2 ea. 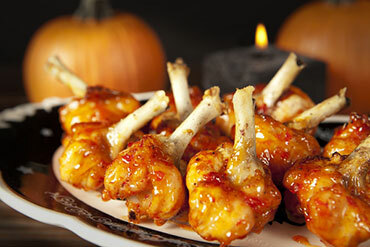 These are a striking Halloween appetizer, because they look like lollipops made out of chicken. The candy coating is actually spicy, sweet, and tangy with a touch of Asian flavor. Swing by one of the following Nugget Markets locations this Friday for a delicious wine tasting! Tasting are just $5/flight, and take place from 5 p.m. - 7 p.m.
Join us this Saturday at Nugget Markets on Covell Blvd. in Davis for our Fall Festival! The event is taking place from 11 a.m. - 3 p.m. and vendors will be sampling tasty fall favorites. Like the gourmet food trucks that brought high-end eats to the masses, popchips teams up with TopShelf Boutique to add some flavor to fall for fashionistas of all ages. Just in time for the holidays, popchips presents an exclusive pop-up mobile fashion truck and shopping experience. Elk Grove November 15, 10 a.m. - 2:00 p.m.
Roseville November 15, 3:00 p.m. – 7:00 p.m.
West Sacramento November 16, 10:00 a.m. – 2:00 p.m.
Davis, Covell Blvd. 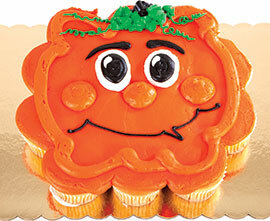 November 17, 4:00 p.m. – 8:00 p.m.
Vacaville November 18, 2:00 p.m. – 6:00 p.m.
Prices valid October 24 - 30, 2012.